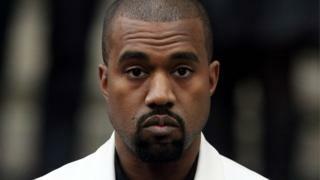 Kanye West and insurers Lloyd's of London have "amicably resolved" his $10m (£7.1m) lawsuit over cancelled tour dates. The Saint Pablo Tour had 21 dates left in November 2016 when West pulled the remaining shows after falling ill.
Lloyd's alleged the musician had used marijuana and refused to pay out, citing a clause in the contract about alcohol and drug use. West, 40, then sued the insurer, citing his treatment at a psychiatric centre. A judge in California dismissed the case on Wednesday after being requested to do so by lawyers from both sides. West's lawyer and Lloyd's both declined to comment, other than to say the matter had been resolved "amicably". The initial lawsuit, filed in August 2017 by West and his touring company - Very Good Touring Inc - detailed how West quit because of his "strained, confused and erratic" behaviour during earlier stages of the tour. The cancellation of the last 21 dates came following West's abandonment of a show in Sacramento. He had performed just three songs during the concert before embarking on an unscripted rant, criticising Facebook, Jay-Z and Hillary Clinton. The rapper then spent eight days in a neuropsychiatric centre in Los Angeles, where it was decided he could not continue with the tour, the lawsuit said. A few weeks after West's lawsuit was filed, Lloyd's of London filed its own countersuit against the company, alleging that the star's reasons for the cancellation were "not beyond [his] control," and therefore denying his insurance claim. However, lawyers for the company denied implying West's "use of marijuana provided the sole basis to deny the claim" and said there were "substantial irregularities" in his medical history.